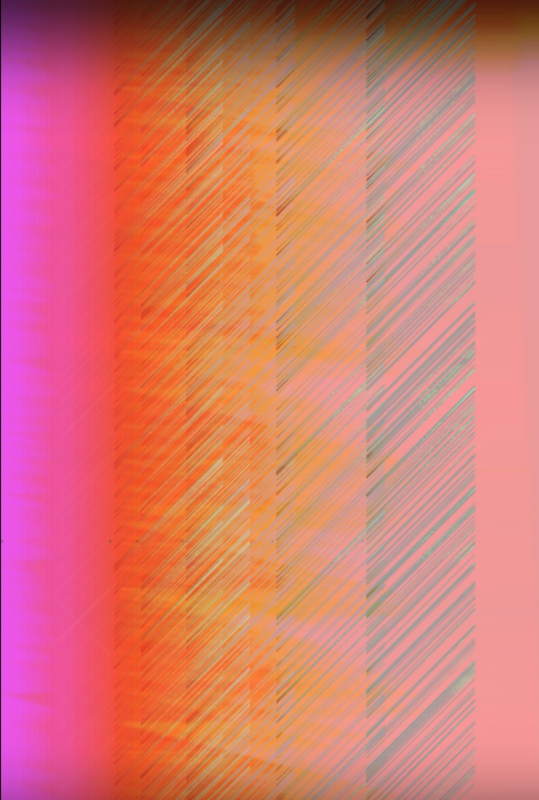 Ultimately, I have produced five digital, animated, iterative paintings. This was certainly my intention. Nothing really went wrong. However there are some aspects incorporated into my five pieces that surprised me and there are some aspects that, I think, could have been improved and that I hope to improve. 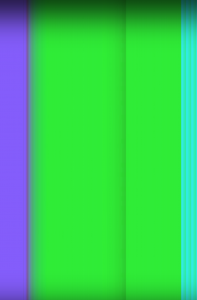 Initially, I aimed to make five pieces all based off of my original colorbar class, which iterates pixel-high rectangles of variable color along the height of a five-pixel-wide bar that can be moved across the screen, essentially “painting” itself if the background isn’t called. Moving forward with the class, I simply wanted to incorporate the new skills we learned since the early days of for loops. Not so simple, actually. I didn’t have much difficulty understanding individual concepts over the course of the semester, but in attempting to combine them I found that creative use of these skills together is the real challenge and most definitely the thing I have to play with if I really want creative control over my ideas. The final pieces were much more reliant on variations and additions to the original for loop than I wished. However a couple of the pieces I think were very successful in exploring the possibilities of layering simple loops because of this more reduced framework. RGB Grain (above) is my favorite painting, and it was also the first I coded. It relies on three different colorbars and a basic interactive function to produce semi-predictable color and texture effects and animation. 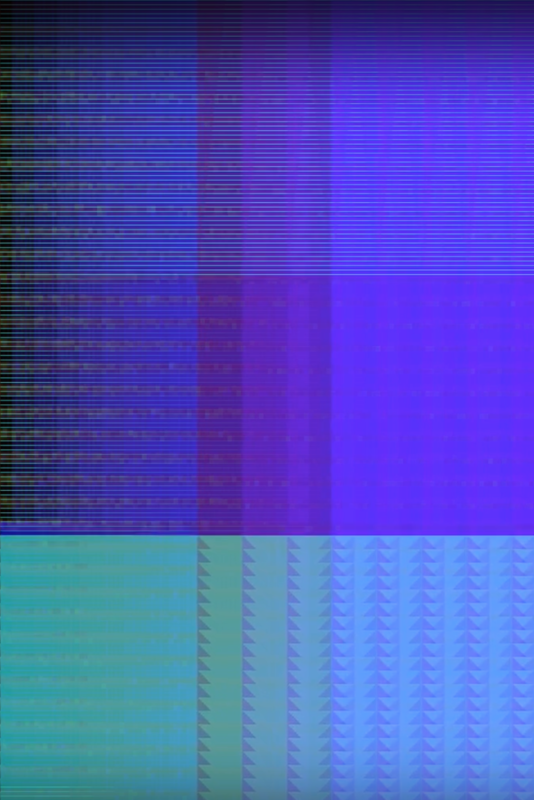 One colorbar moves left, one moves right, and one acts as a shifting color field. The latter is responsible for the more dramatic, intermittent color/texture shifts, as it takes longer to screenwrap and, once it does, it iterates a great number of thin colored lines across the entire canvas at once. 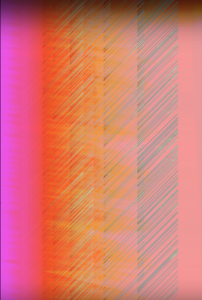 A mouse-press function resets this colorbar with a semi-random, red-leaning color-value, and this allows the viewer of the painting to disrupt its semi-predictable loop and introduce more variation, color and texture-wise, into the piece. 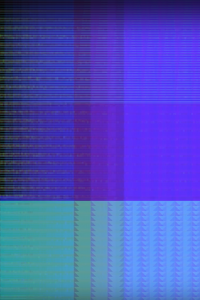 I titled it RGB Grain because the way the colorbars “ripple” across each other suggests there is a with and against the grain to each of them. 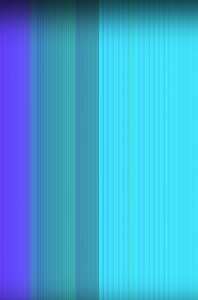 My other pieces tended to involve these three more consistently colored color bars than the more variant ones of Cut Canvas and Heat Scan. My experiments were more with composition, rhythm, shape, and opacity. The biggest challenge was making the pieces appear organic and smooth in their changes. I don’t think I was entirely successful in doing this across all five. Most notably, Flared was a challenge. 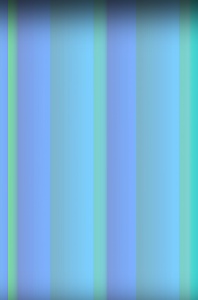 I attempted to use the colorbar from Cut Canvas to make a piece along the lines of RGB Grain. Though I think the dynamic, lively quality of the colors and shapes is interesting, the piece doesn’t vary and evolve as much as it should. The same goes, I think, for Screenbound Ectoplasm Wipe. On the note of that piece, though, I did uncover a couple avenues I would like to explore further in the future through my failures. 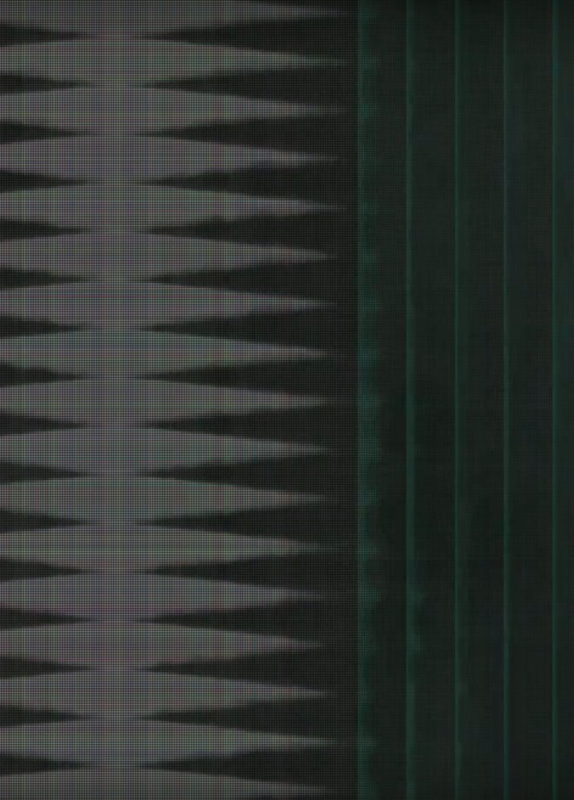 For Screenbound, I found it interesting how using a noise field of simple shapes below a semi-transparent color bar can produce a textured “trail” as the bar wipes across canvas. 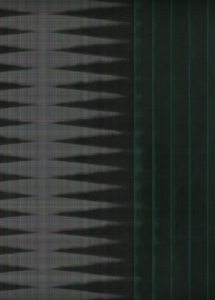 Using noise and transparency to create texture is probably the next thing I want to explore in Processing. I do wish I had more time to work on most of these. I like to save multiple iterations of a piece as I work on it and discover new avenues. I can make “nice” looking things quickly, but I am ambitious with my ideas and I like to follow through with good execution. Though it’s very easy to get into an improvisatory dialogue with Processing and to get interesting, pretty results in this way, I think having a strong initial idea is very important. Otherwise you can just keep working on one file and it can keep evolving into different things. It’s important to have an idea to work towards. That’s not to say, though, that experimentation in Processing is bad and useless. One of the great things about it is how easy it makes experimentation. Lastly, overall Processing pushed me to work in a different way. I don’t usually think too much about color, texture, etc. in the production of my work in other media. I tend to be more of a conceptual artist who, nonetheless, likes to have sensual qualities in his work. Processing brought me back to basics in a way. I found out that I really lean towards the color blue. It taught me that good work can come from simple use of specific tools, that I don’t always need conceptual justification for making things. In the past few years I have really felt that digital art is very important and will become increasingly so. Maybe the conceptual tendency of my work can simply be bound up in the simple use of a particular tool that I have reason to believe is important. Instead of coming up with conceptual justifications for my use of a particular medium, just let the use of the medium justify itself. Art from Code: What is an Heuristic?